A highly unusual verb in Present-day English: it has only this one verb form. Although it was historically a full verb with all its parts ('Come hither Catesby, rumor it abroad, That Anne my Wife is very grieuous sicke. '—Richard III, IV.ii), for most of us today it can only be a past participle. This raises the question of why it should be counted a verb at all, rather than an adjective: compare 'she was rumoured to be dead', 'she was keen/eager/reluctant to be dead': adjectives can take infinitival clause complements. That summer, the Colonel and I leased a bungalow named 947 West Catalpa Boulevard, rumored completely furnished: three forks, but twenty-four nutpicks. 'Completely furnished' is an adjective phrase (AdjP), and adjectives can't take AdjP complements, but verbs can: compare *'eager/easy/pleasant completely furnished' with 'considered completely furnished'. And indeed, on checking Google this morning, I find quite a few "was rumoured dead"—not the way I'd say it myself (I'd much prefer to add 'to be'), but common enough to prove it's verbal in Standard English. So, another discovery. "Well, you know, God bless him, bless his heart, the president of the United States, a total failure, losing all credibility with the American people on the economy, on the war, on energy, you name the subject, and for him to be challenging Congress when we are trying to sweep up after his mess over and over and over again." "And they have no disregard for human life." Don't you just love the English language and all of its little idiosyncracies? I know I do. But, as George Lakoff knows, that center is something of a myth. Jim White (noted UT commenter) attended Netroots 08, and shared with us in a post at AchievingOurCountry his experience at a session videotaped for DFA's night school. The session was based on work from Lakoff's latest book, The Political Mind. To illustrate the concept that there is not a linear scale, Lakoff holds up the brilliant example of Senators Joe Lieberman and Chuck Hagel. The popular press incessantly describes both as “centrists”, yet they share virtually no views. On social issues, Lieberman is consistently progressive and Hagel is solidly conservative. On the war, Lieberman is conservative and Hagel is progressive. They share views on nothing, yet both are branded as centrists. How can there be such a thing as a centrist, or a center, if these two agree on nothing? And isn't it interesting how often we use words that are just as likely to be Reality-challenged as if they were everyday items? As if they were things that you can use and touch. So, that mythic centrist space doesn't really exist, especially not as a spot in one-dimensional space. After all, in politics, even three dimensions can seem inadequate for describing what the hell is going on. I don’t oppose a reckless withdrawal from Iraq because I’m indifferent to the suffering war inflicts on too many American families. John McCain: He said he was indifferent to the suffering that the Iraq War inflicts on many American families. And, therefore, he would not oppose even a reckless withdrawal from Iraq. John McCain. Reckless. Indifferent. That's not a leader we can believe in. One might have hoped for some attempt at an elegant syncrisis—I don't oppose X because Y; I oppose X because…—but, well, that might have raised the question of what sort of withdrawal John McCain could support or, perhaps, if he could support any type of withdrawal at all. I know what it says, but what does it mean? Actual news footage — McCain standing at the microphone, Joe Lieberman in the background. MCCAIN: "Well, it’s common knowledge and has been reported in the media that Al Qaeda is going back into Iran and receiving training and are coming back into Iraq from Iran. That’s well known. And it’s unfortunate." 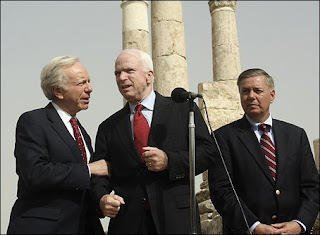 Lieberman steps forward, takes McCain by the arm, and whispers in McCain's ear. MCCAIN: "I’m sorry, the Iranians are training extremists, not Al Qaeda." The scene shifts; a child is in bed sleeping; in the background a phone is ringing. NARRATOR: "It's 3:00 AM and your children are safely asleep. But somewhere in the White House a phone is ringing. Something is wrong in the world. Who's going to answer that phone?" NARRATOR: "What if it's John McCain and Joe Lieberman isn't there to tell him what to say?" AS WELL AS WHAT HE'S SAYING. In honor of Glenn's two most recent posts (here and here), I thought I'd post this little homily on the role of a free press in a democracy. While it may look like a handout for a ninth grade civics class, the source may surprise you. In a democracy the press should operate free from governmental control. Democratic governments do not have ministries of information to regulate content of newspapers or the activities of journalists; requirements that journalists be vetted by the state; or force journalists to join government-controlled unions. A free press informs the public, holds leaders accountable, and provides a forum for debate of local and national issues. Democracies foster the existence of a free press. An independent judiciary, civil society with rule of law, and free speech all support a free press. A free press must have legal protections. In democracies the government is accountable for its actions. Citizens therefore expect to be informed about decisions their governments make on their behalf. The press facilitates this right to know, by serving as a watchdog over the government, helping citizens to hold government accountable, and questioning its policies. Democratic governments grant journalists access to public meetings and public documents. They do not place prior restraints on what journalists may say or print. The press, itself, must act responsibly. Through professional associations, independent press councils, and ombudsmen, in-house critics who hear public complaints, the press responds to complaints of its own excesses and remains internally accountable. Democracy requires the public to make choices and decisions. In order for the public to trust the press, journalists must provide factual reporting based on credible sources and information. Plagiarism and false reporting are counterproductive to a free press. Press outlets should establish their own editorial boards, independent of government control, in order to separate information gathering and dissemination from editorial processes. Journalists should not be swayed by public opinion, only by the pursuit of truth, as close as they can get to it. A democracy allows the press to go about its business of collecting and reporting the news without fear or favor from the government. Democracies foster a never-ending struggle between two rights: The governments obligation to protect national security; and the peoples right to know, based on journalists ability to access information. Governments sometimes need to limit access to information considered too sensitive for general distribution. But journalists in democracies are fully justified in pursuing such information. Yeah, well, you say, everyone should know this, and, yes, everyone should. This is basic ninth grade civics. But just run through these points and see how many our free press and our democratic government violate or ignore. But what, you say, is the point in posting this if this is something everyone knows? The point lies not in the information itself, but in its source: http://usinfo.state.gov/products/pubs/principles/freepress.htm. That's right, this little homily on the role of a free press in a democracy is part of the State Department's primer on democracy — what we preach to the rest of the world while at home the government assiduously goes about subverting and suborning the press. Yes, the same State Department that hires Blackwater, Inc. to massacre Iraqi civilians (or at least doesn't fire them when they do). Perhaps a little statement to the effect that the press should expect the government will try to subvert and suborn it would be a helpful warning to a press that seems to be so easily subverted and suborned. So long as the press is willing to provide favorable coverage of the government in exchange for access, we do not have a free press or a democratic government. A democratic government is supposed to provide access to journalists regardless (no prior restraints and without fear or favor). The State Department says so (just not for domestic consumption). And note particularly the final paragraph concerning the admission that journalists in democracies are fully justified in pursuing such [national security] information and compare that with the insistence of Billy Kristol that the NY Times be prosecuted for publishing national security information (that coincidentally revealed that the president of the US was a felon). Why has the State Department never explained to Billy Kristol the duties and responsibilities of the journalist in a democracy as they themselves promulgate them? Does no one in the State Department ever speak to Kristol? Perhaps it's time for a post about synonyms for vapid? Ashcroft: "Now, listen here. You're comparing apples and oranges, apples and oranges. We don't do anything like what you described." Elsinora: "I'm sorry, I was under the impression that we still use the method of putting a cloth over someone's face and pouring water down their throat. . . . "
Ashcroft: "'Pouring'! 'Pouring'! Did you hear what she said? : 'Putting a cloth over someone's face and pouring water on them.' That's not what you said before! Read that again, what you said before [about the Asano case]!" Elsinora: "'The victim was bound or otherwise secured in a prone position; and water was forced through his mouth and nostrils into his lungs and stomach.'" Ashcroft: "You hear that? You hear it? 'Forced'! If you can't tell the difference between forcing and pouring. . . . Does this college have an anatomy class? If you can't tell the difference between forcing and pouring. . . . "
money into the education of our children"
3: move with force, "He pushed the table into a corner"
7: do forcibly; exert force; "Don't force it!" I guess if it will ease Ashcroft's mind semantically, we can agree on using some variation of forcibly pouring, or poured by force. However, the words and phrases emphasized above should have sufficed. Time to reclaim these words. They don't really sustain their proper meanings when applied, e.g., to our esteemed Press. "Elites," as I understand the term, are the cream of the crop, those with expertise to share, and with verifiable discernment. Journalism's true elites are not those who think it is too difficult to do actual research, or that they merely have to present two opposing views, no matter the facts of the case, in order to be objective. Nor do they think that facts have a liberal bias, but rather understand they are simply based in Reality. "Elites" may or may not belong to the uppermost income brackets. Although they often do, belonging to that bracket does not automatically confer "elitism" on a person; nor should it. Merit also counts. Can someone suggest to Glenn that he find a new word to characterize America's press coverage? While Glenn's regular use of the adjective "vapid" to describe the writings of the mainstream media is a completely apt descrption, he needs to insert a little variation into his narrative or else he's creating his own google bomb. If you google greenwald vapid, you get about 20,000 hits. An occasional post without "vapid", using instead some equally valid synonym such as "insipid", "pointless", "inane", "lifeless", or "tiresome", probably wouldn't damage the thrust of Glenn's prose and might even make it less predictable and, heaven forbid, "vapid". On the other hand, perhaps Glenn intends for "vapid" to become a signature word, so that "vapid press coverage" is automatically associated with Greenwald much as Carthago delenda est calls to mind Cato the Elder. If so, he's well on his way. (Update 4/6/08): Never mind. I've just read Glenn's post on the AP fluff piece on AG Mukasey and there really is no other word for it than vAPid. and support the Rule of Law. 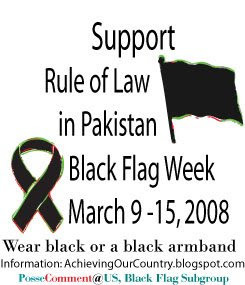 Next week, March 9-15, is Black Flag Week in Pakistan. The lawyers in Pakistan will carry black flags. And they will probably march, as they have done since November, for the reinstatement of the judiciary, for the rule of law, and for the return to the Constitution and democracy in Pakistan. The head of the lawyers, Aitzaz Ahsan, president of the Supreme Court Bar Association, has been knocking heads with the government over the rule of law during multiple dictatorships going back to Zia ul Haq and Ayub Khan. Pakistan has not had a steady democracy, but rather military dictatorships alternating with often corrupt democratic rule, for most of its history. The current military government took power in a coup in 1999 at the end of a standoff with India at the line of control, the separation between the two countries in Kashmir. Pervez Musharraf rewrote the Constitution, and ruled as both the head of the military and the president, and has staged rigged elections to maintain power. When the Constitution forbade him to run again this year, he fired the Chief Justice of the Supreme Court, Iftikhar Chaudry, hoping to get a better decision on running. Ominously, he had also been apprehending and interrogating terrorism suspects, holding them without charge, and allegedly turning them over to the Americans for interrogation. The Court released many of them, and demanded that the government either bring charges against the others and arraign them in court, or release them. The rest of the court did not go along with Musharraf’s move, and reinstated Chaudry. On November 3, 2007, Musharraf declared an Emergency, and suspended the Constitution. He placed many thousands under house arrest, he sacked the entire Supreme Court and judiciary and made signing an oath to support the rules he replaced the Constitution with a precondition to reinstatement. He created a packed court, but most of the original justices refused to sign, and many justices and barristers were placed under house arrest. As well, many human rights workers, in particular Asma Jahangir, the Pakistan Human Rights Commissioner, were put under house arrest, as were political candidates, including Benazir Bhutto. With his permission to run in hand, Musharraf scheduled elections, but there were many flaws, and many protests. Musharraf, under both domestic and international pressure, lifted the Emergency, but many remained under house arrest, especially many lawyers, including Aitzaz Ahsan, and Justice Iftikhar Chaudry (who still are). Most of the world knows that Benazir Bhutto was assassinated in Rawalpindi on December 27, 2007. This led to postponement of the elections, many realignments, and the issues of democracy, the Constitution and the judiciary coming to the fore. On February 18, opposition parties delivered a crushing defeat to Musharraf’s party, and a new government is forming around the Pakistan People’s Party, the Pakistan Muslim League - N (Nawaz), and the Awami National Party in the FATA region. There was an overwhelming vote in this referendum for the return to the rule of law, to secular government, and to reinstate the Constitution and judiciary. The Pakistani Parliament has two houses, the lower house, and the Senate. Musharraf’s people maintain a majority in the Senate, although it is weakening (6 senators broke with the majority last week bringing his lead there to 51-49). But although the incoming coalition has the two thirds majority it needs in the Lower House, it does not in the Senate, and therefore impeachment or a restoration of the 1973 Constitution (the last completely ratified) will wait until the necessary votes are there. Most observers believe this is only a matter of time as long as the pressure is on, and hopefully not too much longer. Stunningly, the government of the United States is continuing to treat Musharraf as if he has not suffered such a massive defeat. If democracy is to mean anything, the will of the people cannot be thwarted, and the U.S. support has brought criticism and suspicion of Americans in Pakistan. Throughout the crisis since November 3rd, people who watched the news in Pakistan have seen pictures of the lawyers, dressed in their trademark black suits, demonstrating for reinstatement of the judiciary and the return to the rule of law. These haven’t been the most peaceful of demonstrations, lawyers have been beaten, some arrested, there are allegations of harsh interrogation, in one case a lawyer’s kidneys failed during imprisonment, and tear gas. These lawyers have persevered, and continue to demonstrate. For those paying attention, this has been a drama that is at once uncomfortably violent, and inspiring in the courage shown by the lawyers, by the people who attend the demonstrations where it is not unheard of for people to be injured or die at the hands of bombers, by the people who went out to vote, by the bloggers and press, who maintained the flow of information both internally and out of the country and shot down concocted stories and propaganda that governments use when they are in trouble. Before the elections, the new military chief, General Ashfaq Pervez Kayani, ordered the army to vacate all government positions, and to maintain a separation between the military and the government. This move was instrumental in keeping the level of vote rigging low enough for the will of the people to be heard during the February elections. So the signs are right for a real return to democracy, for a real return to the rule of law, and for reinstatement of the Constitution and the judiciary in Pakistan. A healthy secular democracy there is an outcome that will benefit the entire world, and as we have learned in many countries over the past two decades, the real basis for a healthy democracy is respect for the Constitution, and the rule of law. On Black Flag Week, there is an opportunity to show solidarity for the Pakistani lawyers and their struggle for the things that we in this country hold to be fundamental — civil rights, democracy, law, and a Constitution. It isn’t there yet, and it won’t be unless the pressure is kept on. Even once it comes, it will be a slow climb out of corruption and broken rule, and the country has many problems including poverty, religious militancy, and illiteracy. The new government will more than have its hands full. It will have a much easier job if the laws of the country are secure. Please help show support for these lawyers. Please wear a black armband or other black clothing during the Black Flag Week, and please take the time to educate others on what that clothing or armband means. If the rule of law is fundamental, then it is never too unimportant to grow and strengthen it, anywhere in the world. The issue of word manipulation in politics and media is really Glenn Greenwald's claimed territory, but I can't let this week go by without commenting on it. Why? Because I heard a short news clip from the BBC about the six Guantanamo prisoners who have finally been charged with some sort of crime. And the broadcaster did something that made me want to break things: he said that one suspect's confession was under question because it had been gained using "the controversial waterboarding technique," a phrase that news media have universally decided is an acceptable way to refer to torture. 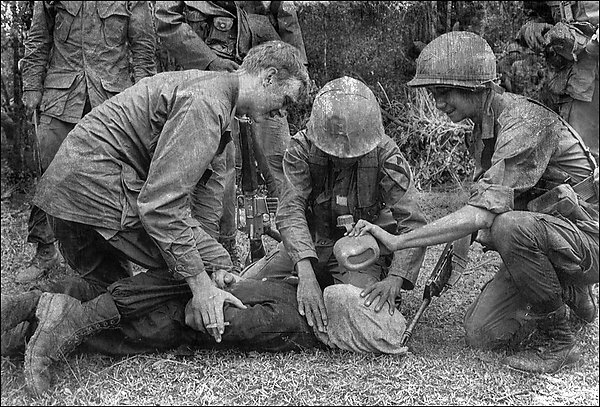 By not calling waterboarding torture, news media around the world are complicit in the US government's flagrant violations of the Geneva Conventions and the ease with which they discard their humanity. By not simply saying straight out that acts such as waterboarding are wrong and evil, news media are pushing a pervasive doublethink on populations around the world. This is where we get our information--if the BBC doesn't call it torture, it must be at least debatable, if not perfectly okay, to partly drown people in order to make them say things. Must be okay, then, to deprive them of sleep, give them electric shocks, kick them, pull their hair, herd them into camps designed to cut them off from families, cultures, and societies, and then gas them. What the hell is the difference? We're all familiar with the idea of doublethink and how it has infiltrated our news outlets and common culture. We're also familiar with the tricks politicians use to make their atrocious positions more acceptable. We all know, here on a blog devoted to language use, that words can be used to manipulate and trick and redefine how we think. Oil drilling in the Arctic National Wildlife Refuge is "energy exploration." The Refuge itself is made more vague by calling it ANWR. Coal gained from blowing up pristine mountains and leveling them is a source of "clean energy." Global warming is now "climate change" (although I think that one backfired a little bit). And torture is a "vital interrogation tool." It is unacceptable that news media play along with these tricks, just to keep the Bush administration happy. Pollution is pollution. Coal mining is filthy and destructive. Compassionate conservativism means absolutely nothing. And torture is torture. The administration claims, as we all know, that they need permission to use these techniques to preserve our national security. What sort of security are we talking about? Our simple physical existence? What kind of physical security do you have if you've sold your soul to the devil (sorry for the melodrama)? What could possibly be more important to our national security than preserving our humanity? So I missed out on my promised Thursday post last week. A teething baby, a house full of guests ... ack. There are a number of minor language topics on my mind this week: politically correct terms, thoughts on The Golden Compass series, questions of mass language manipulation. But the most recent one to come up is one of those niggly little issues that annoys me like a mosquito buzzing around my half-asleep ear every time I turn the light out. I'm looking for words for two concepts that, as far as I know, don't have real words. The first is one I heard for the first time this week: heterosexual life partner. This, I'm told, is something like what a bosom friend used to be, except we don't really use that phrase anymore outside of bra shopping. My younger sister has one, and another old friend has one. But what an ugly thing to call the person you consider to be more than a best friend but less ... attached, shall we say, than a spouse! Besides which, to me it can be confused with the relationship of heterosexual people who live as spouses but aren't married. In fact, I hate the word "partner" for describing that kind of relationship. It sounds so much like a business arrangement, nothing romantic or hopeful or optimistic in it, really. Anyway, any good suggestions for heterosexual life partner? The other is a little more complicated. It's a writing issue. I'll try to explain. Sometimes you write a scene in a story, or go into a long thought-chain in an essay, in which the character or narrator is meant to be in a particular place -- this especially comes up in travel writing. And you get caught up in your narration or thoughts on the character or whatever, and your words go on long enough that the reader forgets where you are meant to be. When this happens, bringing the reader back to that place can be a little jarring. So when you're revising, or someone's editing for you, you need to put in little placement reminders. For example, I was working on a colleague's essay about Cuba. She was describing sitting at an outdoor restaurant there, and was writing about Cuban economics and people's personal career situations and so on. She thought it went on too long, but all she needed was a little reminder that we were sitting in the restaurant: "The waiter brought us beers and I shifted the milk crate I was sitting on to let an old woman pass" or something like that. I find these lines really important, and for myself I made up a shorthand name for them. I call them 'locator lines.' But I'm thinking there either must already exist a good term for them, or someone can come up something a little shorter or more poetic. Any ideas? If I haven't explained very well, please say so. Introvert Girl is not a talker. But you probably guessed that. Being an introvert, of course, I can thrive on a really meaningful conversation with one or two people whose opinions and ideas fire my imagination. For a couple of hours. Once a week. But I don't like being on the phone (really don't like it). I don't like frequent social gatherings. I don't like having guests in my house who can't entertain themselves. I usually need a day to myself to recover from a party, and a solid week to myself to recover from houseguests. So what could possibly turn I'Girl into a babbly, chatty, talking idiot? If you know that I've recently had a baby, you know the answer. It's not that his gummy, gorgeous smile prompts me to go "coochy-coo" at him on a whim. Nope, it's worse. It's a book. When I told her I was pregnant, my sister presented me with What's Going on in There? which is a book about baby brain development written by a neurobiologist. And it's good, really good -- interesting and educational and persuasive. I have some issues with the research the author quotes, which involves horrible behavior toward rats, monkeys, and orphaned and abused children, but that's a very small part of the book. A very large part is given over to the development of language in babies. And I've discovered, to my sorrow, that talking constantly to a baby (not just around the baby or near the baby) during its first couple years lays a a foundation for complex language development that can never be made up in later life. Research has shown that, no matter what your economic class or social background, the more you talk to a baby, the better its brain develops. The effects of early language exposure last well into elementary school, and, if maintained through childhood years, throughout a kid's learning life. You've got to talk, talk, talk. And it's hard. For someone who revels in silence and who can go whole happy days not saying a word to anyone, it's a massive shift in habit. (I usually use up my chatting energy by doing filial duty on the phone. I thought I could rack up talk credits while expressively directing my words at him while I was on the phone, but somehow he knows the difference and doesn't engage.) My only incentive is the overwhelming evidence that my constant chatter is really, really important to this fourteen-pounder's little brain. What's Going on in There? has been a true mind-opener for me. But as I try to remember to tell my son what I'm doing as I'm trying to make myself lunch, or spend an hour exchanging babble with him in his room, I kind of wish, secretly, that I hadn't read it. Ignorance is indeed bliss. [sigh] ...and it was written by a "journalist"
Wouldn't you think that a Serious Journalist would be more careful about email composition, especially considering how easily one's emails can appear in places where one least expects to find them... such as here. The following example simply cries out for a bit of editing (at a minimum), and, if I'm honest, a bit of embellishment, as well. Please! Feel free to chime in with your own suggestions. That way, even on days that I don't consider my best, or anywhere close, I can look myself in the mirror and know I tried to be fair and didn't call into question someone's credibility just for sport, or because I like seeing my name on a website or my face on TV. [Frankly, a little more skepticism would be welcome, not for sport or fame, but because our country faces so many serious challenges, many of which might have been avoided entirely if our current president had faced more skepticism during his first campaign, or even during his second. The original post on Greenwald's blog can be found here. Today I bow my head to the gods of language devolution. I give up. The stupidifiers of language win. Today my Gmail automatic spell-checker told me I had spelled "doughnut" incorrectly. "Donut" was the right formation of letters to describe a ball of dough fried in oil. Fine. Go ahead. Have your strawberrys and your two week's notice and your donuts and your nucular energy, too. I'm too tired to argue. But why is it that people who insist on certain spellings or pronunciations out of ignorance always get to win? Don't we get one? Just one? A little one? Me, I'd really like to keep the word "nauseated." I realize it's a lost cause, that there are few of us anymore who shiver when someone says, "I feel nauseous," but that's my pick. It's a perfectly good word, as is "nauseous," and I don't see why language should be muddied by using the latter for more meanings than it previously had. Talk about downsizing! Residents of dictionaries oughta complain. They're being fired right out of existence. Speaking of which, I'm having lovely little time-wasting sessions playing vocabulary games on the Free Rice link recommended by Karen. But does anyone else find some of their definitions a little ... odd?